Hello again! With midterms and Fall Break this week I have been swept away with work and to-do lists but it feels good to be blogging. 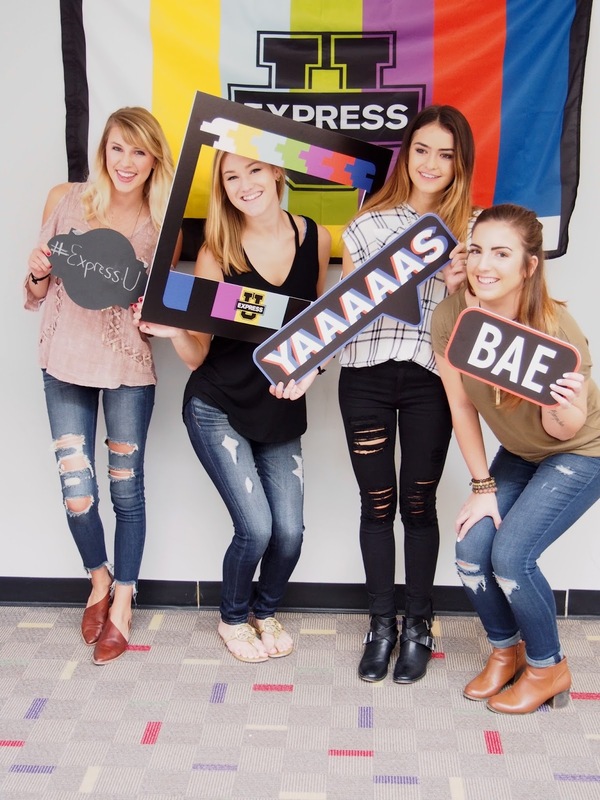 Recently we had an amazing event at my college with our local Express Ambassadors! It was a DIY-Denim event where we got free goodies (jeans and jean shirts) and we were able to decorate them with patches, pins, and fabrics pens! If you have not been a reader of mine for some time then you probably are not aware of my relationship with denim items. Let's start with jean shirts! I love them. They are seen in about MOST of my Life's Styles posts and they are amazing versatile pieces of clothing that everyone should have in their wardrobe. 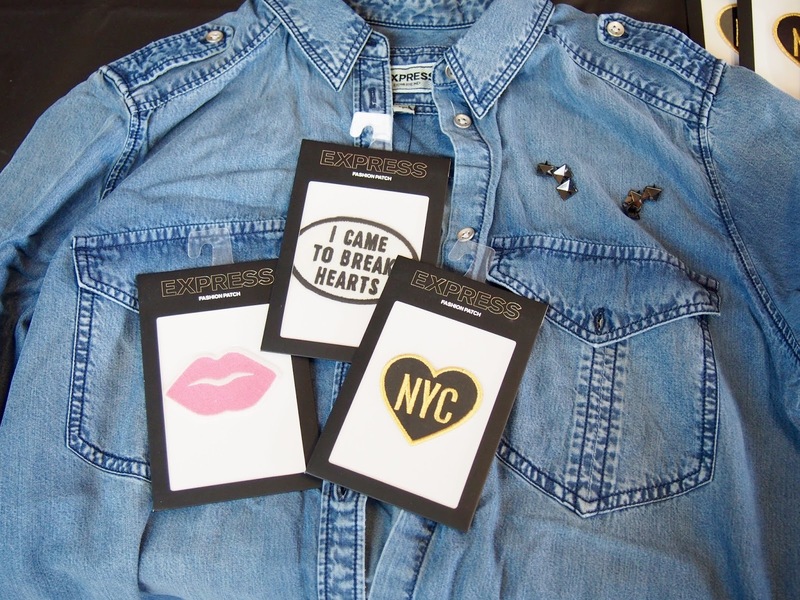 Luckily I was able to grab a jean shirt and place some super cute patches on it. I already have two jean shirts and a denim jacket that I rotate through, so of course I was happy to add another one to the collection! If I buy another jean shirt I might have a serious problem, but this one was for the free! How could I resist? Now onto my feelings about jeans. Did I mention there was a photobooth with props? My favorite! If you have been a reader of The Strong Suit for some time then you know that my relationship with jeans has had its ups and downs. In my Denim Days post I mention how I literally hated jeans for a while. The only pants I wore (to mother's dismay) were leggings and quite frequently. Jeans were uncomfortable and constricting to me until...I got a summer job where I was made to wear them. I decided when shopping for jeans that I would aim for a higher price range because maybe fast fashion jeans just were not working for me (sorry Forever and H&M still love you). I was right! I bought to pairs of Express jeans for $40! Hooray for clearance sections! Ever since then I realized that I did not have a problem with jeans, I had an issue with the quality of jeans. Did It happen if there's not a Polaroid to document it? 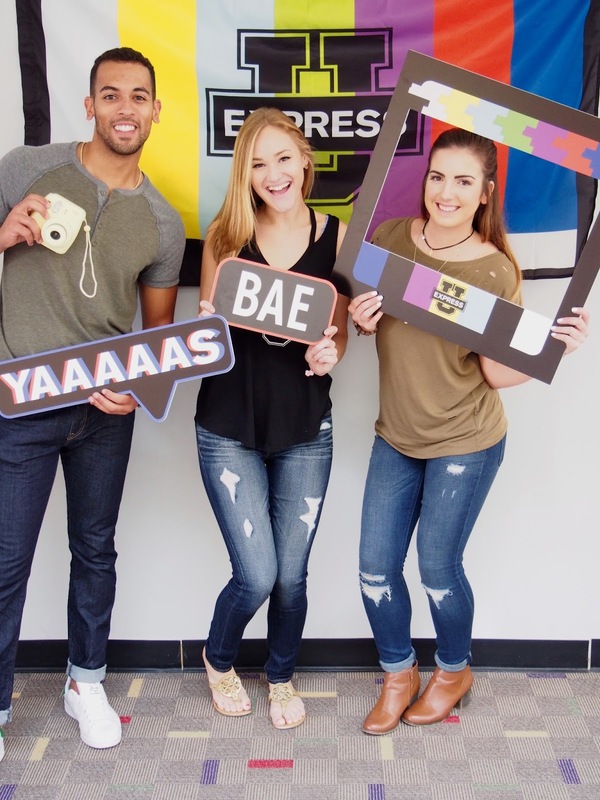 I now have three pairs of Express jeans that I love and endorse completely! Express really goes above and beyond when it comes to the quality of their jeans. The three styles I have are the cropped bell, the flare leg, and holey jeggings. The holey jeggings I was also able to grab from the Express event at my school! There was only a size 4 left and seeing as I wear sizes 0-2 I was weary when I went to try them on. I remembered this summer though that since the fit was supposed to be tight the four might actually look cute and boyfriendish on me since it was a few sizes up. I ended up loving the look and decided to keep those as well! I can not wait to show you guys in a future Life's Styles post so keep an eye out. 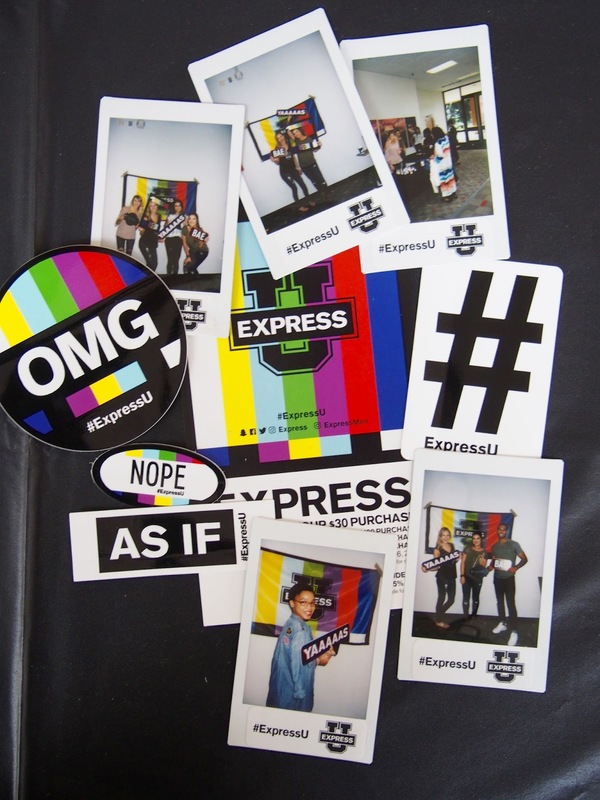 Overall I really enjoyed the DIY-Denim event and it really made my love for jeans and Express grow even the more! I love the ambassador program because people get to represent a brand on a local level that does not include trying to get sales. The event was fun and people were genuinely excited to see the products and try on the jeans they liked the best. It was also great to decorate our denim goodies and take our minds off of the slowly approaching midterms haha! 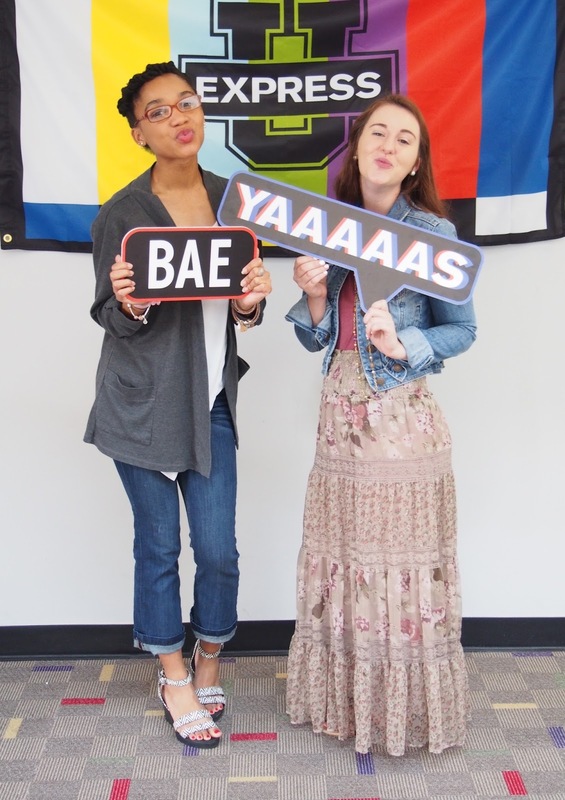 I am so grateful to my campus ambassadors Ali, Emily, and Jalen for putting on a great event!